ESPN continued its coverage of the 2011 World Series of Poker on Tuesday night with two new episodes of the Main Event. Last week, Phil Collins dominated at the start of Day 6. With 90 players from the original field of 6,865 still competing for a share of the $64,531,000 prize pool, coverage of Day 6 continued with a few notables still in the field including Allen Cunningham (965,000), Tony Hachem (1,930,000), Ben Lamb (7,240,000), Erick Lindgren (2,765,000) and the aforementioned Collins, who happened to be the chip leader with 8,655,000. Let’s Get It On: The start of the broadcast featured a new feature table lineup and started with the blinds at 20,000/40,000 with a 5,000 ante. In the first hand, action folded to Brian Yoon in the small blind and he raised to 100,000 holding . Ben Lamb was in the big blind and called with , leading to the flop. Yoon was technically ahead and he continuation bet 110,000, although Lamb had a better chance of winning the hand. Lamb responded with a raise to 305,000, which was enough to take down the pot. The semi-bluff raise had been kind to Lamb throughout the Main Event, and it seemed Day 6 wasn’t going to be any different. Former Chip Leader Gone: Daryl Jace, who spent a lot of time atop the chip counts before Day 6, was all-in for his last 325,000 with and called by John Hewitt who was holding . The flop gave Hewitt a huge lead, but the turn gave Jace some hope. Unfortunately for Jace, the river blanked and he was eliminated from the Main Event in 89th place for $76,146. Cunningham All-In: At an outer table, Allen Cunningham was all-in for 510,000 with and up against the of Marc-Andre Ladouceur. It was a classic race, but things looked bleak for Cunningham when the flop fell . In addition to his two overs, Ladouceur had picked up a double gut-shot straight draw. Surprisingly, neither the turn nor river helped Ladouceur, and Cunningham doubled to 1,125,000. The board ran out and Bounahra, who hails from Belize, doubled to 2,050,000. Two Women Remain: Claudia Crawford was eliminated in 85th place ($76,146) after her open-ended straight draw failed to come through. Her elimination left two women in the field: Amanda Musumeci and Erika Moutinho, girlfriend of poker pro David “Doc” Sands. Three-Way All-In: Sebastian Ruthenberg opened for 85,000 with and was met with a three-bet to 235,000 by Pius Heinz who held . 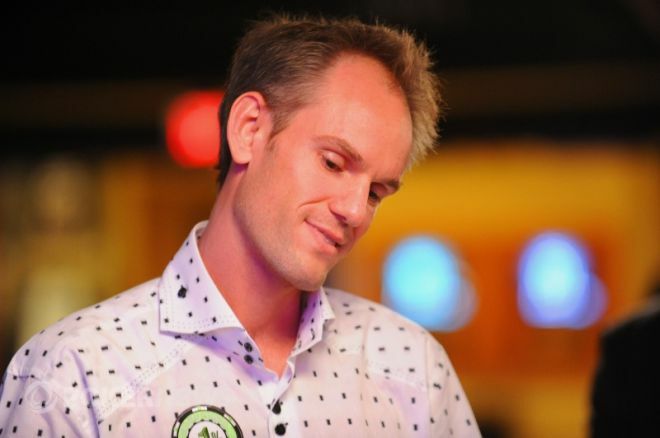 When action reached Jared Vengrin, he looked down at and shipped his remaining 1.26 million. Ruthenberg then moved all-in over the top, putting Heinz to a decision for all his chips. The young German tanked for awhile before calling off for 3.11 million. Shock spread across the table as over 7.5 million was at stake in the hand. Heinz was a 44 percent favorite to win the hand, which increased to 63 percent after the flop. The turn changed nothing, and neither did the river. Heinz more than doubled on the hand, Ruthenberg lost two-thirds of his stack, and Vengrin was eliminated in 73rd place for $90,343. Cunningham Eliminated in 69th Place: In the second hour of the broadcast, Allen Cunningham was once again all-in preflop and up against Mar-Andre Ladouceur. Unfortunately for Cunningham, was on the bad end of a cooler. With 1,780,000 on the line, the board ran out and the five-time bracelet winner and 2006 final tablist was sent packing in 69th place for $108,412. Bellande Out the Door: Tri Huynh, who looked down at , opened for 115,000 and action folded to Jean-Robert Bellande in the small blind. The former Survivor contestant moved all-in for 935,000 with the inferior , and Huynh quickly called after the big blind got out of the way. The flop was disastrous for Bellande, and the turn left him drawing dead. The meaningless was put out on the river for good measure, but Bellande was busto in 65th place ($108,412). Impressively, Bellande notched back-to-back top-100 finishes in the Main Event. Last Woman Standing: Amanda Musumeci was all-in preflop for her last 850,000 holding and racing against Ryan Lenaghan's . Musumeci, one of only two women still remaining in the Main Event, sat back down after the flop came down and kept her in the lead; however, the on the turn put her at the brink of elimination. The river was no help, and Musumeci became the 62nd-place finisher, good for $130,997. Meanwhile, Erika Moutinho became the last woman standing in the Main Event. She was seated at the feature table and was joined by her boyfriend, David “Doc” Sands. Speaking of which, ESPN aired a segment featuring their relationship, including how she learned poker and the joint business venture the two have undertaken. The two started DGS Management and Consulting, a company that helps organize poker players' lives. The Doctor is In: At the feature table, action folded to Erick Lindgren in the hijack and he opened for 120,000 with . David “Doc” Sands made the call from the button with and the two were heads-up to the flop. Both players ended up checking, leading to the turn. Lindgren took a shot by firing out 150,000, Sands called, and the peeled off on the river. Sands had hit the nuts and was no doubt happy that Lindgren bet 340,000. Sands responded by moving all-in and Lindgren snap-folded. Tune in Next Week: Every Tuesday leading up to November, ESPN will air two episodes of the 2011 WSOP Main Event. Be sure to either check your local listings or come back next week for our recap of the action.